2’3’-c-di-AM(PS)2 (Rp,Rp) is the Rp,Rp-isomer of the 2’3’ bisphosphorothioate analog of 3’3’-cyclic adenosine monophosphate (c-di-AMP). c-di-AMP is second messenger molecule produced by bacteria that has potent immunostimulant activity in mammals . This cyclic dinucleotide (CDN) induces the production of type I interferons (IFNs) following its recognition by the endoplasmic reticulum-resident receptor STING (stimulator of interferon genes) and the recruitment of TBK1 (TANK-binding kinase 1) and IRF3 (interferon regulatory factor 3) . 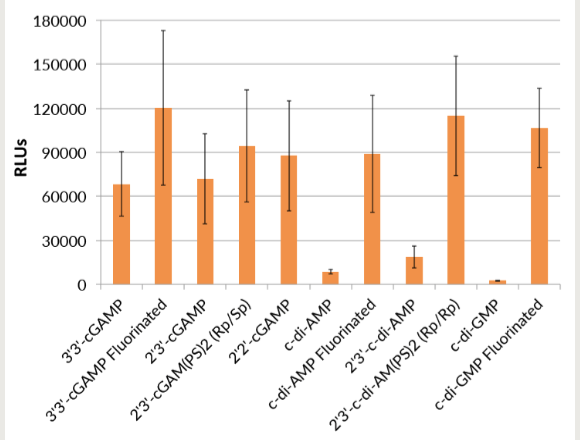 2’3’-c-di-AM(PS)2 (Rp,Rp) has a higher affinity for STING than c-di-AMP due to the presence of a 2’-5’, 3’-5’ mixed linkage, as found in endogenous human CDNs produced by cGAS (cyclic GMP-AMP (cGAMP) synthase) . It activates all known human STING alleles as well as mouse STING. 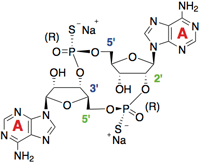 In addition, this analog contains two phosphorothioate diester linkages to protect it against degradation by phosphodiesterases that are present in host cells or in the systemic circulation . The Rp, Rp dithio diastereoisomer was found to induce higher type I IFN production compared to the Rp/Sp dithio diastereoisomers or c-di-AMP . InvivoGen has developed STING reporter cells in two well established immune cell models: human THP-1 monocytes and mouse RAW 264.7 macrophages. These cells express a reporter gene (SEAP or Lucia luciferase) under control of an IRF-inducible and/or NF-κB-inducible promoter. Woodward JJ. et al., 2010. c-di-AMP secreted by intracellular Listeria monocytogenes activates a host type I interferon response. Science.328(5986):1703-5. Jin L. et al., 2011. 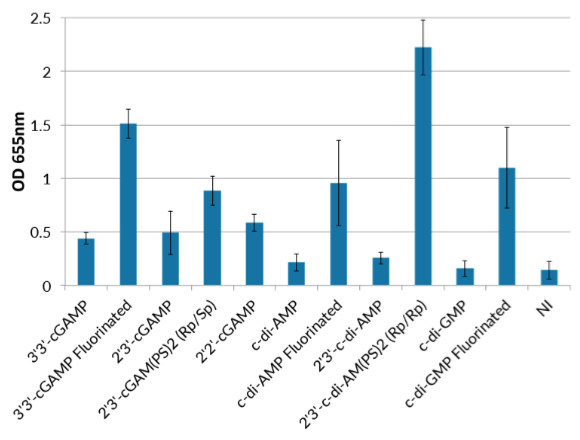 MPYS is required for IFN response factor 3 activation and type I IFN production in the response of cultured phagocytes to bacterial second messengers cyclic-di-AMP and cyclic-di- GMP. J Immunol. 187(5):2595-601. Corrales L et al., 2015. Direct activation of STING in the tumor microenvironment leads to potent and systemic tumor regression and immunity. Cell Rep. 11(7):1018-30. Yan H. et al., 2008. Synthesis and immunostimulatory properties of the phosphorothioate analogues of cdiGMP. Bioorg. Med. Chem. Lett. 18, 5631–5634. 2’3’-c-di-AM(PS)2 (Rp,Rp) VacciGrade™ is a preclinical grade preparation of the cyclic dinucleotide 2’3’-c-di-AM(PS)2 (Rp,Rp). It is prepared under strict aseptic conditions and is tested for the presence of endotoxins. 2’3’-c-di-AM(PS)2 (Rp,Rp) VacciGrade™ is guaranteed sterile and its endotoxin level is - The ability of 2’3’-c-di-AM(PS)2 (Rp,Rp) to induce type I interferon (IFN) has been confirmed in THP1-Blue™ ISG cells. 2'3'-c-di-AM(PS)2 (Rp,Rp) VacciGrade™ should be stored at -20°C. STINGel: Controlled release of a cyclic dinucleotide for enhanced cancer immunotherapy.